As the name suggests, the Fukuoka City Subway is running the city Fukuoka, Japan. This rapid transit network has 3 lines, serving 35 stations in total. It began operations in the year 1981 and is under the operations of the Fukuoka City Transportation Bureau, since then. This subway network has some of the most modern facilities there on offer. Not only does it have automatic platform gates at every station but it also has all of lines operated automatically by the ATO system. As a precautionary measure, this nearly 30 km long network of lines, employ drivers for enhanced safety concerns. The subway system has three lines, Line 1, 2 and 3 also marked in Orange, Blue and Green as K,H, and H respectively. Line 1 is called Kūkō Line and it covers 13 stations over 13.1 km. It runs between stations Meinohama to Fukuokakūkō. Line 2 is called Hakozaki Line and it covers 7 stations over 4.7 km and runs from Nakasu-Kawabata to Kaizuka. Line 3 is called Nanakuma Line and it serves 16 stations over a distance of 12 km and runs between Hashimoto and Tenjin-Minami stations. The Kuko Line runs in an east-west direction from the Meinohama station towards Fukuoka Airport, Hakata and Tenjin. There is also a service operating to the Karatsu station in Saga-ken district. A makeup ticket has to be purchased for travelling along this route as from the west of Meinohama, the service is operated by JR Transports. The Hakozaki Line runs down south to the Kaizuka district from Nakasu Kawabata in the North. One place of importance on this line is the Yoshizuka Branch Office Building. The Nanakuma Line is the latest addition to the Fukuoka Transit Network. It serves as a connection between Tenjin-Minami and Hashimoto. In order to transfer over to the Tenjin Station from Tenjin-Minami, you will be required to take a short walk of five minutes through an underground shopping mall. The subway begins operations at 05:30 am in the morning and runs until 00:25 am, the next day. The time interval between each trains varies between 4-8 minutes. Map of Fukuoka City Subway showing various lines and stations. 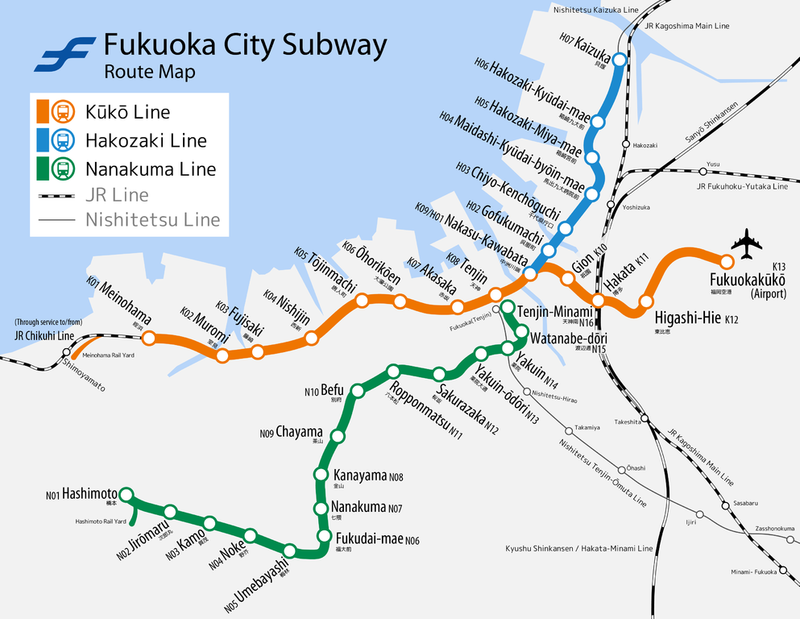 Click on the map to enlarge it or download Fukuoka City Subway Map in PDF. The ticket prices on Fukuoka City Subway are distance based. The system is divided into six zones. Riders can purchase single tickets for travelling to various zones. Zone 1 is a distance of 0-3 km, and an adult ticket is priced at 200 yen. Children and people with disabilities get discounts and a zone 1 ticket for them costs 100 yen. For zone 1, Otonari-Ticket can be purchased for travelling to next station from one station. This ticket costs 100 yen for adult and 50 yen for a child and people with disabilities. Zone 2 is a distance of 3.1 km to 7 km and an adult ticket costs 260 yen. A discounted ticket can be purchased for 130 yen. Zone 3 is a distance of 7.1-11 km, and an adult and discounted ticket can be purchased for 300 yen and 150 yen respectively. Zone 4 is 11.1-15 km, and the ticket price for this zone is 330 yen and 170 yen for adult and child / disabled person. Zone 5 is 15.1-19 km and an adult ticket costs 350 yen while a child / disabled person ticket costs 180 yen. Zone 6 is 19.1-23 km and the tickets are priced at 370 yen and 190 yen for adult and child / disabled person respectively. All tickets can be purchased from vending machines at the stations. Children under one year of age can ride the city subway for free. Two children aged 1-6 years can accompany a fare paying adult for free. Child fares apply for any extra children. Elementary school students in the age group of 6-11 years pay child fares while for children above 11 years of age, adult fares apply. A Day Pass can be purchased for unlimited travel in one day between Meinohama and Fukuokakuko, Nakasu-kawabata and Kaizuka, and Hashimoto and Tenjin-minami. This pass also provides discounts at some places. This pass can be purchased for 620 yen for an adult, while the price for child and disabled person is 310 yen. Frequent travelers can purchase Commuter Pass. The pass provides savings and is available for one month, three months and six months. This pass can be used for designated areas. Frequent travelers who want to use all subway lines can purchase Chika Pass. This pass is also available for duration of one, three and six months. The system also uses a contactless smart card called Hayakaken Card. The card is rechargeable. An unregistered Hayakaken card can be used by anyone but cannot be reissued in case of loss. A registered Hayakaken card can be used only by the registered user and can be reissued when lost. Many subway stations are nearby or in close vicinity to various sight-seeing spots. The Fukuoka City Museum and Fukuoka Tower are located at 15-20 minutes from Nishijin subway station. The Ohori Park is just 1 minute from Ohorikoen station while Fukuoka Art Museum and Ohori Park Japanese Garden are 15 minutes from Ohorikoen subway station. The Kushida Shrine and Shofukuji Temple are 5 minutes from Gion Subway Station. The Fukuoka Sun Palace and Fukuoka Kokusai Center are located at 15 minutes from Gofukumachi station. The Fukuoka Zoo and Botanical Garden are 30 minutes away from Yakuin-Odori subway station. I keep seeing a bunch of stuff about the Chika pass but I’m not sure on the pricing for 1-3-6 months… and if I’m married is there a ‘family’ discount even further for that? I’ll be going to school in Fukuoka starting here next April.. Just wondering the best way to do this. I’ll be using the JR line as that’s where I’ll be living near and going into Hakata to go to school. Hi. My name is Kim and I’m planning to embark on a solo backpacker trip to Fukuoka in late November this year. I’m planning to buy a JR Kyushu Pass for 5 Days because a lot of travel sites do recommend it for a much cheaper travel specially when you’re planning to go to Nagasaki and Kumamoto. Is the JR Kyushu Pass also valid to use for Kuko Line, Hakozaki Line and Nanakuma Line? As well as other Trains in Fukuoka? Thank you!